Interpol President Meng Hongwei's wife reported him missing after he left France to visit China. He's seen here during the Interpol World Congress in Singapore last July. Meng's whereabouts are unknown. But the South China Morning Post, citing an anonymous source, reports that he was "taken away" by Chinese authorities immediately after he arrived in China. No reason was given for any potential investigation into the official. Police in Lyon, France — where Interpol is based — were alerted to Meng's seeming disappearance by his wife, who said she became worried when he fell out of touch after leaving for a trip to China, according to Le Parisien. His wife and children live in Lyon, reports Europe 1. Details about the case are still emerging; as for where Meng is believed to have gone missing, a source told Agence France-Presse, "He did not disappear in France." Interpol released a statement saying only that it was "aware of media reports in connection with the alleged disappearance" of Meng. The agency added, "This is a matter for the relevant authorities in both France and China." Beyond that, French authorities have not released any details about the investigation; instead, it has been described by multiple sources who spoke to media outlets. 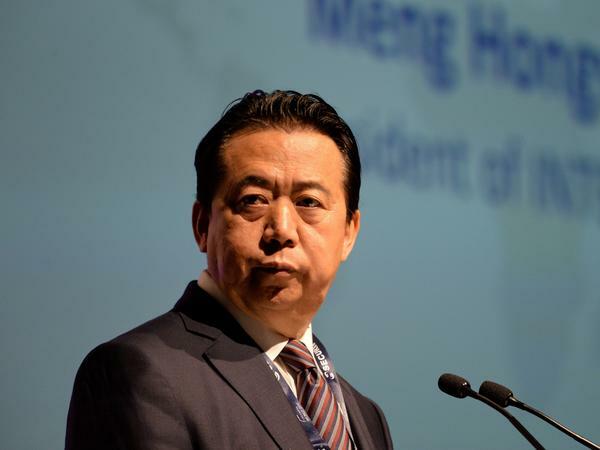 Meng was elected president of Interpol in 2016; his term runs through 2020. He is a veteran of China's police and security systems, serving as the country's vice minister of public security and the head of the country's Interpol bureau. His past duties include running China's counterterrorism office. As of Friday, Meng was still included in the list of leaders on the Chinese public security ministry's website. But unlike others on that roster, he's no longer listed as being a member of the agency's Communist Party Committee – a designation he held as recently as March, according to the Internet Archive. When he was elected, Meng was the first Chinese official to take the post, and it triggered a range of responses. China Daily emphasized the potential boost to China's recent clampdown on corruption, noting that China had increasingly worked with Interpol to pursue "China's 100 most-wanted fugitives suspected of corruption." But human rights groups warned of possible abuses. Amnesty International said Meng's rise to the international office was "alarming given China's long-standing practice of trying to use Interpol to arrest dissidents and refugees abroad." Interpol has 192 member nations, in an organization that allows police agencies to collaborate and share resources. Its president heads the executive committee, which guides Interpol's priorities and strategy. Interpol's day-to-day operations are overseen by its secretary-general.